Industry Experts, Inc. unveiled the global market report on Polymerase Chain Reaction (PCR). The new report entitled “Polymerase Chain Reaction (PCR) – A Global Market Overview” reveals that Asia–Pacific is expected to the fastest growing market with a CAGR of 9.2% during the period 2017-2022 while North America is the largest market for PCR with 2017 market is estimated at US$3.5 billion. Polymerase Chain Reaction (PCR) is a technology that has opened up new vistas for advances in life sciences research and molecular diagnostics due to its attributes, such as detection and quantification of DNA and RNA genetic materials. Advanced PCR techniques, such as digital PCR are employed by researchers in quantifying and analyzing rare alleles and point mutations. The existing crop of market participants is focusing on developing PCR systems offering improved capabilities, such as an extensive menu of tests and higher sensitivity and specificity. 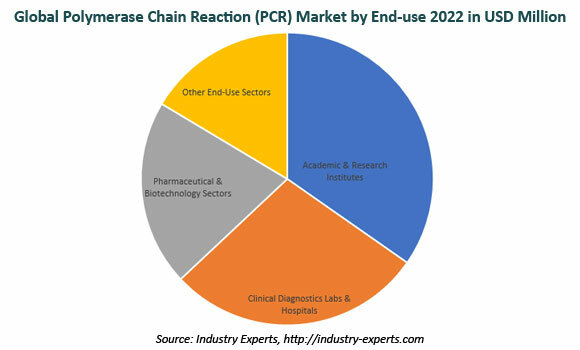 Global demand for PCR in Clinical Diagnostics Labs & Hospitals, among end use sectors, is slated to record the fastest CAGR of 8.6% and reach a projected US$3.5 billion by 2022. By Applications area, Life Sciences lead the global market for PCR, which is estimated at US$3.9 billion (45% share) in 2017 and is projected to reach US$5.5 billion by 2022 to reflect the slowest 2017–2022 CAGR of 7.3%. The report analyzes the market for PCR product segments including Instruments, Reagents & Consumables and Software & Services while key application areas comprise Clinical Diagnostics, Life Sciences and Others. The study also explores the global market for major end use sectors of PCR including Academic & Research Institutes, Clinical Diagnostics Labs & Hospitals, Pharmaceutical & Biotechnology Sectors and Others in terms of value in USD for 2014-2022 analysis period in the global markets comprising North America, Europe, Asia-Pacific and Rest of World. The market for Polymerase Chain Reaction is segmented into four major global regions namely, North America, Europe, Asia-Pacific and Rest of World. The regional markets further analyzed for 11 more independent countries across North America – the United States, Canada and Mexico; Europe – France, Germany, Italy and the United Kingdom; Asia-Pacific – China, India, Japan and South Korea. The market is analyzed in all of these major regions by key county, PCR product segment, application area and end-use sector in terms of value in US$. This 344 page global PCR market report includes 216 charts (includes a data table and graphical representation for each chart), supported with meaningful and easy to understand graphical presentation, of market numbers. The report profiles 14 key global players and 33 major players across North America – 19; Europe – 10; Asia-Pacific – 3; and Rest of World – 1. The study also provides the listing of the companies operating in the PCR industry. The global list of companies covers the address, contact numbers and the website addresses of 161 companies.